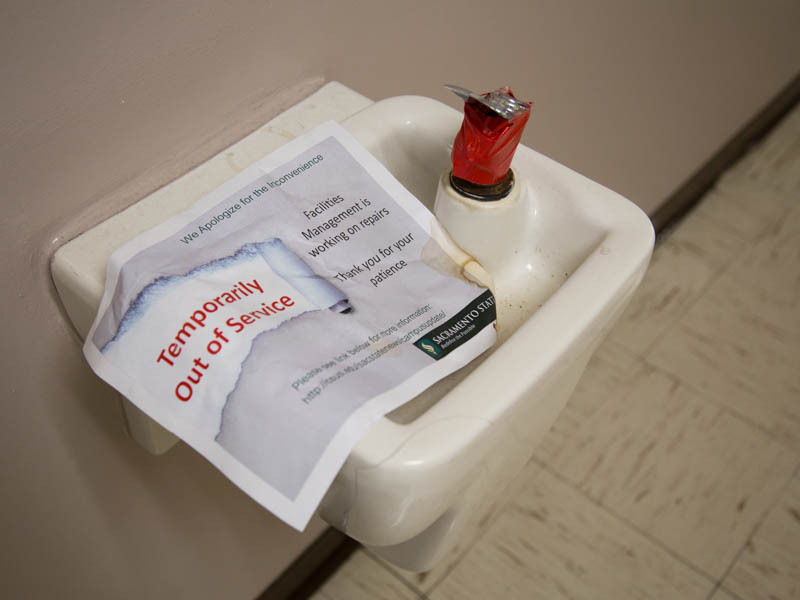 A few dozen drinking water faucets on the Sacramento State campus had to be replaced because of high lead levels last year. An audit released Tuesday shows that the California State University system exposes students and employees to on-campus hazards such as faulty laboratory equipment, unsafe drinking water, asbestos and chemical spills. Auditors examined four CSU schools — Channel Islands, Sacramento, San Diego and Sonoma — and none of the campuses could demonstrate that they provide students with safety training before working in laboratory environments, according to the report. “Without resolving these issues, campuses cannot ensure they are effectively protecting students and employees against injuries and illnesses,” wrote auditor Elaine Howle. She said without regular equipment testing, there’s no guarantee that equipment will function properly during an emergency. Three of the four campuses did not conduct required inspections of laboratory safety equipment such as eyewash stations, emergency showers and fire extinguishers. The Sacramento and San Diego schools failed to post warning signs outside rooms containing asbestos, the report found. And all four campuses had fallen behind on reviewing their protocols for lab workers using hazardous chemicals. Sonoma hasn’t updated its plan for six years, and Sacramento hasn’t done so for 15 years, according to the audit. The California State University Employees Union requested the audit after recent incidents on Sacramento State’s campus. In one case, a professor and a group of students found excessive lead content in the drinking water. In another, a faulty shelf in a laboratory led to a chemical spill that contacted two students’ feet. The employees tasked with cleaning up the spill say they suffered health problems after the exposure. The union also raised concerns about an employee who claimed the university fired him after he brought up concerns about asbestos. Toni Molle, director of public affairs for the CSU system, said officials agree with the audit and will comply with the auditor’s recommendations. Those include forming a statewide health and safety committee, requiring timely reports from all campuses on equipment inspections and employee trainings, and reminding campuses about asbestos signage requirements. Molle said the system convened a health and safety task force in January of last year. They’ve also created a lab safety and training group, retained an environmental health and safety consultant and began offering online safety training. Editor’s Note: Sacramento State holds the license to Capital Public Radio.